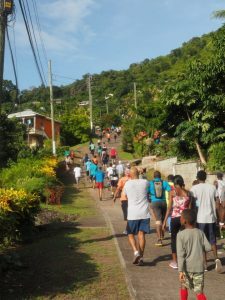 Hash #956 was held at Cool Breeze Bar, St George – next to the National Stadium and was changed from what was going to be a night hash to regular 3:30pm hash due to a challenging trail. The hares Bling Ting, Rear Entry, Wrong Erection and the rest of the “Bling Crew” made sure we had some wonderful views on both he runner and walkers trails. I think the hares stood at the location, looked around them at all the hills and mountains – found the absolute highest point they could and said – perfect – we will hash up there! 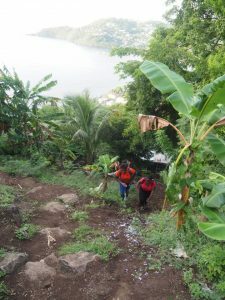 So we hashed up the great uphill trail to the highest point (with wonderful views) and when we got back down to sea-level – the trail made a left turn and we hashed right on up another great hill! Lovely bush trails, with shade which was needed as the day was really humid and hot after the mornings rain. Good music, food, drinks and dozens of sweaty muddy hashers are all the ingredients required for a great after hash lime. Thanks Bling Ting and Crew for a wonderful hash & lime!